It’s chilling, wild, full of vivid, if uncomfortable imagery, not unlike the Brontës’ work and is a perfect way to open this excellent new collection of writing inspired by the sisters and intended to help raise funds for The Brontë Birthplace Trust and their plans for Thornton, Bradford – the village where all three sisters were born. In Jane Eyre, the Red Room was, of course, the room where Aunt Reed locked up the young Jane as a punishment and where Jane imagines the ghost of her Uncle Reed who died in that room and where she becomes hysterical. This Red Room won’t feel like any kind of punishment to those who open its pages. You’ll want to stay within them until the end and, even once you finish, you’ll want to dip back in again. I read each story 3 or 4 times, and tried to leave some time between each one, so that I could properly savour the different response each contributor had to either an image, a line or whatever other prompt they used as their starting point. (Each contributor explains their inspiration or starting point for their story at the back of the book and this made for an interesting read in itself. I’m always intrigued not only by what triggers a story or response in a writer but where that then leads.) As this collection shows, these are every bit as varied as the writers themselves. Edited by A.J. Ashworth, this is a strong collection and there is a story for every kind of Brontë fan: whether you prefer Emily, Charlotte or Ann’s work; whether you’re interested in their lives or those of their fictional characters; whether it’s the landscape they wrote about so compellingly that you love, or the language and style in which they wrote; or whether you have a fleeting knowledge of their work or one that’s more in-depth, you’ll enjoy seeing where one or more of these contributors was inspired to go. Personally, I’ve always preferred the brooding menace of Wuthering Heights over Jane Eyre’s struggle to find love and freedom, so it’s probably no surprise that I relished the first story, Stonecrop, by Booker-nominated Alison Moore. It’s such a darkly clever tale, so deftly written that the malice cuts deep. I believe I enjoyed Vanessa Gebbie’s slightly irreverent but hugely fun Chapter XXXVIII – Conclusion, an alternative ending to Jane Eyre, almost as much as I imagine she enjoyed writing it. And Elizabeth Baines’ excellent That Turbulent Stillness cleverly demonstrates the devastation that a passionate, all-consuming relationship can wreak on someone close to those involved and how sometimes it’s good to look at ourselves and what we’re doing ‘through another’s eyes’ if we can. That distance can be invaluable and might even save us from making a terrible mistake. I thought David Constantine’s Ashton and Elaine was wonderful and worked both as a stand-alone story for non-Brontë admirers on the impact adults can have on children in their care or that they come into contact with but also held a deeper resonance for fans of Wuthering Heights. And as in Wuthering Heights, the moorlands that feature are as much a character as the humans in the story. Carys Davies’Bonnetis a beautiful story full of emotion, being willing to risk embarrassment and humiliation and remaining dignified in the face of it that had me sniffling each time I read it and I can’t wait to read more of Carys’ writing. I recognised and felt for the word nerd in David Rose’s Brontësaurus in equal measure, even if I don’t think (hope?) that I would ever have started on his venture. I both loved and winced at how his story ends. It’s so fitting. Rowena Macdonald’s A Child of Pleasure struck a real chord with me, having taught teenagers similar to Jemima and Tania Hershman’s A Shower of Curates was a clever and fun piece of writing. Sarah Dobbs Behind all the Closed Doors was heartbreaking to read: the importance of certain books and their associations for us and those who know us and the loss of a loved one through a child’s eyes and the confusion brought on from being placated and, however misguidedly, shut out by the adults dealing with their own grief and/or trying to protect you. Emma is one of my least favourite of Jane Austen’s heroines, because of her persistent, misguided attempts at matchmaking, so I chuckled my way through her meddling correspondence with Jane Eyre in Zoë King’s My Dear Miss… I sniggered, nodded, tutted and groan-laughed my way through Bill Broady’s entertaining Heathcliff versus Sherlock Holmes and then found a really satisfying end to the collection in Felicity Skelton’s The Curate’s Wife – A Fantasy with its tones of the French Lieutenant’s Woman (and yes, I do realise that’s not a Brontë novel!) combined with the feeling that I would have wished this to have happened. 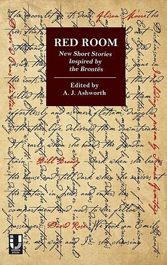 Red Room is not only an excellent collection of new short stories in its own right but it’s also one that captures the essence of the Brontës and their writing and world for me. It’s an excellent addition to your Brontë-related collection, or a terrific gift for the Brontë lover in your life, as well as being a great way of helping to raise funds for the Brontë Birthplace Trust. My thanks to Unthank Books for providing a copy of Red Room for review. Red Room is edited by A.J. Ashworth and published by Unthank Books. It is available to purchase from the Unthank Bookshop and from online retailers such as Amazon UK, Amazon US, The Book Depository and Waterstones.